They can make or break a console or computer.......they are the part of u do when everything you play a game.......they become part of you, almost a 5th limb.....some of them even give you BLISTERS! They are Joy Pads & Joysticks. The Video Gamers very own tool of choice that are used to interact with our favourite medium. 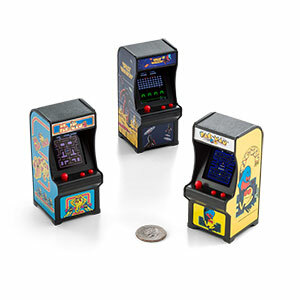 We have gone through the Joy Pads and Joysticks from years gone by in order to give you our Top 5 most Iconic ones. These are the ones that are almost as famous as the console or computer that they belonged to and brought JOY to Generations of gamers worldwide. So Lets get cracking with our first stick of JOY! 5. 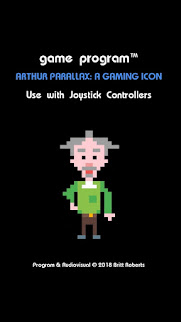 The Atari 2600 "Classic"
This Joystick is the ultimate in simplicity and design but it truly is the Joystick of the earliest gaming generations from 1977 to 1986. When you think Atari , you think of this Joystick. A true Classic and a cracking one to start our Top 5 with! 4. The NES "Control Pad"
The Nintendo Entertainment System introduced the world to the JOY PAD and boy did it bring JOY! Although not very ergonomic in its design we think it more than makes up for that with it's unique character. The NES Joy Pad had 4...YES 4! Count 'em .... Buttons! As well as a nifty multi directional "D Pad"
We know that the NES was the system that turned Videogaming on its head again after the crash of 1983 and the humble NES Joy Pad played a big part in that. The PS1 got the ball rolling on this one when the original grey controllers were designed truly with the player's grip in mind. When the PS2 was released we got a whole new ball game of a Joy Pad. 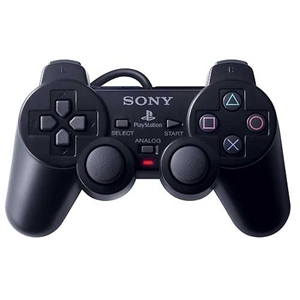 It had the 2 Analog Sticks for a start which were revolutionary at the time and now are standard across the two big systems of today. The Dualshock's main unique selling point was the fact that it had two motors inside which gave it the vibration capability in order that you could get feedback from the in game action......Very COOL! 2. Megadrive / Genesis "Batarang"
Playing on this Joy Pad after playing on the NES pad was like heaven on your hands as your mitts really fitted nicely into this great design. With 3 active buttons in close proximity to each other it was a dream to use. It also looks very cool just like a "Batarang" from Batman which made it's playground appeal even more! This pad reminds us of hours spent on Mega Bomberman & Earthworm Jim so has a lofty second position in our Top 5 countdown and rightly so! So.......who comes in at Number 1? 1. Super Nintendo "6 Button Joypad"
Pictured is the "Parma Violet" U.S Version. Just look at how this baby is moulded for pure gaming comfort. You can't see it from this pic, but the shoulder buttons are nestled nicely on top of the pad, ready to send out a heavy kick or punch in SFII or a Powerslide in Mario Kart. For us this was the pinnacle of Videogaming control. SNES JOY PAD......GET IN THE FREEZER!! What Joystick did you love? Which Joy Pad could never be parted from your hand? Let us know what classic controller you think we should have included! 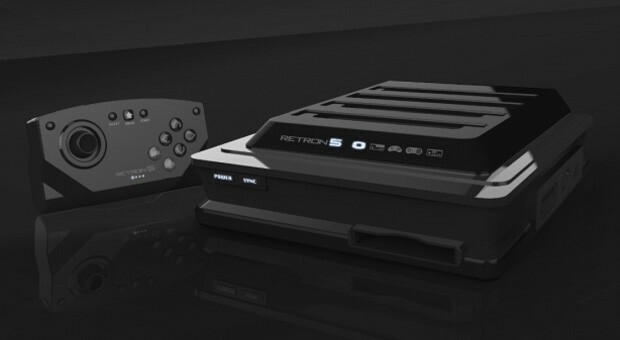 The RetroN5 Makes Us Go Weak At The Knees! But Will This Beauty Ever Get A UK Release??!! 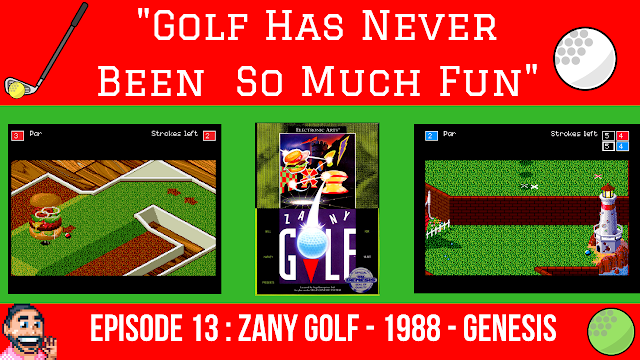 Being massive Commodore Amiga fans here in The Freezer we just love the banner on this site. It's a picture of a Cool "Amiga 500" on a desk with Sensible Software's legendary Cannon Fodder loaded up ready to play. That picture sets the tone for "Reality Glitch" with the opening line underneath that reads "Welcome To The World Of Yesterday!" A large chunk of Reality Glitches' articles are Amiga related, which we absolutely can't get enough of! For example we got really excited in one of the articles where the talk is all about "Favourite Amiga Demo Disks"
As we read on we found that one of our all time demo disc Amiga mashups is mentioned! "CANNON SOCCER"
Great Stuff! We Love it! Sifting through the site we also found some great articles on Arcade Gaming which included a review of one of our fave Arcade Games of all time "Teenage Mutant Ninja Turtles"
4 PLAYER MENTALISM AT ITS BEST! Overall, we spent a good couple of hours reading some of the cool articles on Reality Glitch and we cant wait for the next installement! Reality Glitch - It's time for you to GET IN THE FREEZER as our WEBSITE OF THE DAY! Take a look at Reality Glitch today and let us know if it got your retro juices flowing? Picture this, you've had a hard day at work and want to unwind with a pint of your favourite tipple, so where do you head? A) The pub near work full of suits and no atmosphere? B) The Local Arcade Bar full of Retro Arcade Games and lovely cool refreshing pints of the good stuff? Just one problem though.......B doesn't exist in London......YET! What better mix than Arcade Games, Beer and Cool Music??!! 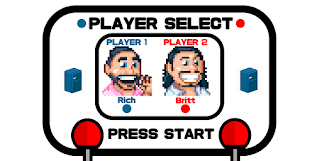 At the moment the guys (&girl) from Retro Game Base , run the ONLY Retro Gaming shop in London! So why not help them to start up the first and only Video Game Arcade Bar in London? Check out their Crowd Sourcing Page for some really cool investment rewards! As of today (18/07/13) they only have 3 days left to raise the required £5000. Currently the running total is at £1321 so they really need a massive final push to really make this dream happen! So Retro Gaming People, lets use the Power Of The Freezer and start donating! How do you like the sound of a Video Game Arcade Bar? What would you call your Video Game Arcade Bar? 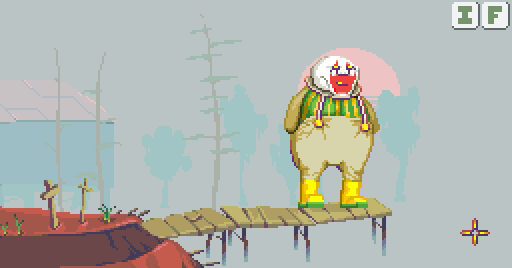 Dropsy The Clown is billed as a Surreal Exploration Based Adventure Game. There's something quite different about this game though that seems to set it apart from others. The game asks you to Guide a sweet but accident-prone clown through strange worlds in a fresh take on the classic point and click adventure. Dropsy is an open world adventure game with an emphasis on surreal atmospheric elements and environmental storytelling. Dropsy takes major influences from Monkey Island, Full Throttle and Grim Fandango and creates its own unique twist by placing Dropsy into a unique open ended exploration based framework. The aim of Jay Tholen is to create an almost entirely text-free experience with colorful characters to communicate with, but the dialogue will be handled through the use of visuals. This is supplemented by expressive animation and some lovely looking detailed surroundings. Rather than spoon feeding the player the narrative, the goal is to allow the player to discover the narrative at their own pace. Solutions to puzzles will emerge organically as more is learned about Dropsy's world. So this will hopefully eradicate those moments where you try to "USE" "SPANNER" with "HONEY" in an effort to solve a puzzle that just doesn't make sense. As Jay Tholen puts it in one of the promo videos, "The Puzzles will be solved by having one of those EUREKA moments...."
The Story tells us of a deadly fire at Dropsy's family's circus, resulting in the tarnishing of Dropsy's image as a local hero. The BIG TOP tent now serves as a home for Dropsy and his family, Dropsy and his father get by through collecting scrap metal and the completion of odd jobs. The player guides Dropsy and his dog "Eughh" on an adventure through humor, wondrous sights, and buried secrets. Some Bizarre & otherworldly events occur as the player discovers more about the BIG fire and Dropsy's mysterious past. Wiithin the game there will also be the opportunity to explore Dropsy's Dream World for 10 minutes at a time when Dropsy goes to sleep, although this is entirely optional. This will enable players to discover even more about Dropsy's story if they wish to. This sounds like a great twist on the usual adventure gameplay that we cant wait to see how it will pan out. Overall this seems like a very different plot and gameplay than your usual adventure game fayre and we love the sound of it. Add to this the the soundtrack that will borrow from almost every relevant genre of the past 70 years! Think Earthbound + Spaghetti Western + Anatolian rock. We've had a listen to a sample track and it is sounding very cool and unique. "After years of relentless begging, our first computer was purchased in early 1997. My parents' tight financial situation meant that new games were a Christmas-only affair, so most of my early PC gaming experiences came out of the bargain bin. While I didn't like it then, I now appreciate that I was 'forced' to play older games. Had it not been for this I probably would've missed the entire Adventure genre. Everything changed upon receiving a copy of Sim Tower for my Eleventh birthday. A demo of Klik & Play contained on the disc sparked a passion for game design in me that has never waned. I joined the 'klik' community shortly after and began pumping out retrospectively awful, but ultimately necessary, amateur games. It was in these days that I met Justin, the programmer for Dropsy. My creative gaze shifted toward music after discovering Prog Rock in my junior year of high school. This led to an intense period of consuming as many challenging, unfamiliar sounds as my little nerd ears could possibly handle. Discovering artists like Brian Eno, Albert Ayler, and Magma were important milestones for me. After graduating, I purchased my first mixer and MIDI controller and began concocting my own. Inevitably, the two passions began to converge. In 2007 I became active in the Chiptune and VGM communities and have released Twenty-Five albums and EPs since." The GamesFreezer Team Love The Look Of Dropsy, What Do You Think Of Dropsy? What Point & Click Adventures Do You Really Love? Will you be pledging any funding to Dropsy ? This website is so well presented and stuffed full of nuggets of information from the full spectrum of Video Gaming Trivia. 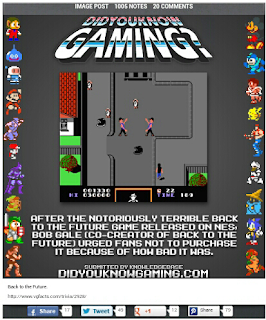 Whether it's Retro Gaming or current generation gaming you are interested in then Did You Know gaming have got a fact or a piece of trivia that will make you smile or say "Well I didn't know that!" The great thing is that they present the piece of trivia / fact with a screen-shot of the actual game, which brings it to life nicely. Whenever we visit the site we end up searching our favourite games over the years for a nice nugget of info and then in most cases we will end up digging out the game and playing it again to locate the screen from where the nugget came from. The A - Z search function at the top makes it easy to try and locate your fave game series and helps you start digging for info. We recommend that you head over to Did You Know Gaming and get hooked on Gaming Trivia NOW! 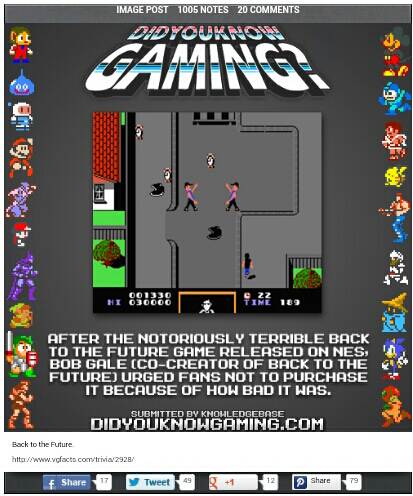 What do you think of "Did You Know Gaming" ? What's your favourite piece of gaming trivia? Growing up everyone had a Spectrum or if they were really lucky they owned an Amstrad! I spent my entire time going round to my friends houses after school to play these machines and really liked the idea of owning my own "Speccy" with a disk drive......surely (at the time) the most advanced piece of kit out there! There have been a few games that I anticipated with great expectation only to find out from a review that it was an absolute stinker of a game and a few that I maybe thought I would enjoy but no matter how good I knew the game was just couldn't enjoy it. 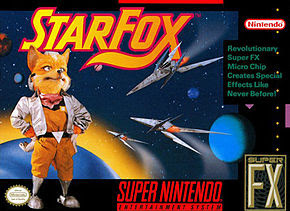 For years the SNES was crying out for a great footy game. It had to wait years for ISS to come out and blow everyone away, but before that came the news that KICK OFF was coming to SNES in all its 16bit glory. I read the pages of Super Play Magazine and Nintendo Magazine System with deep joy as I thought how great Kick Off would be on the SNES.......Months went by as the magazines previewed the game constantly teasing me with a few more screenshots. Then came the review......it turned out the game was a turkey!! My dreams of controlling Tottenham Hotspur on my shiny new SNES were blown apart....it was back to Nintendo's very own Super Soccer for me to get my footy thrills. 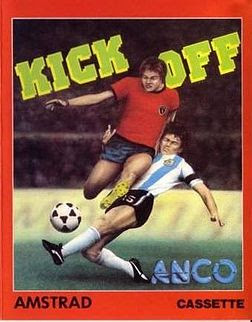 No matter how tempted I was to buy Kick Off it never happened and will be forever disappointed. 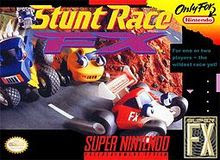 This is probably a controversial inclusion for a game that included so much cutting edge technology such as the Super FX Chip. All the reviews were glowing with 90% scores and yet when I played it I was particularly underwhelmed. I just didn't get why everyone was raving about this game. The only thing I did like was how your team mates would radio into your cockpit with updates of what was going on. But unfortunately Starwing bit the dust early on for me and it was traded in pretty quickly. Looks like a recurring theme for me here with all the SNES games that didn't live up to their promise. Again with this one it had glowing reports, all the latest technology (the fabled Super FX Chip) and yet again, I just didn't get it. It reminded me of a badly made set of Lego vehicles with poor handling and a really annoying surround on the screen where the action took place, again this was consigned to the trade pile pretty quickly! When I was younger with no responsibilities I played a lot of Championship Manager, days were eaten up by taking my Nottingham Forest team through 12 seasons of glory until all the "regen" players took over from the real world players and I was left with a load of unknowns. I felt that after such over exposure to Championship Manager it was time to get my management kicks elsewhere, hence why I went for Premier Manager. It had received good reviews and was seen as an alternative to Champ Manager. The game looked impressive and I have to admit, initially it was good to play a management sim other than Champ. So there I was with a shiny new PS3 for christmas! Inside was one game......it was GT5. 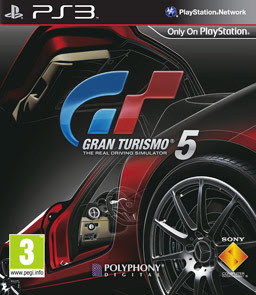 My last encounter of GT was on PS1 , the original GT and I loved it at the time, it was so novel to have a driving game that you could invest hours of time just tweaking and collecting and building. Fast forward 5 reiterations later and you have the all singing all dancing version of GT! The problem with it though, is that it's lost it's soul, it's almost too realistic and maybe there's too much on offer, too many things to do. Have you got any disappointments that you would like to tell The Freezer about? Consign them to the Freezer's deep freeze forever by letting us know and we will dispose of them carefully! As you all know, the GamesFreezer loves discovering a new website and todays website of the day is "JOYSTICK JOURNAL"
We fell in love with this website immediately due to the cool retro styling of the homepage. Check out the Retro looking Joystick on the website banner, thats the kind of thing that floats our boat here at GamesFreezer! When you start to explore the articles on Joystick Journal you will find a whole set of well written thoughts on various aspects of gaming from past to present. We like Joystick Journal's style and that's why it's our GamesFreezer Website of the day! Let us know what you think of Joystick Journal?